x Peptoboonsmal) was bred by The Roan Rangers, of Weatherford, Texas, and boasts 239 money-earning cutters with average earnings of $25,355. and is owned by his son Cody Hedlund, of Weatherford, Texas. The father-and-son team showed Meteles Cat to 2015 earnings of $164,511. Meteles Cat’s long list of wins includes the Breeder’s Invitational 5/6-Year- Old Non-Pro and the Western Bloodstock/ National Cutting Horse Association (NCHA) Showdown In Cowtown Non-Pro. Two more of Metallic Cat’s top offspring – Purple Reyn and Stevie Rey Von – were bred by Brandon Dufurrena, of Gainesville, Texas. Dufurrena rode Purple Reyn to the 2015 NCHA Non-Pro Horse of the Year title, while his father, Ed Dufurrena, rode Stevie Rey Von to the 2015 NCHA Futurity Open Championship. 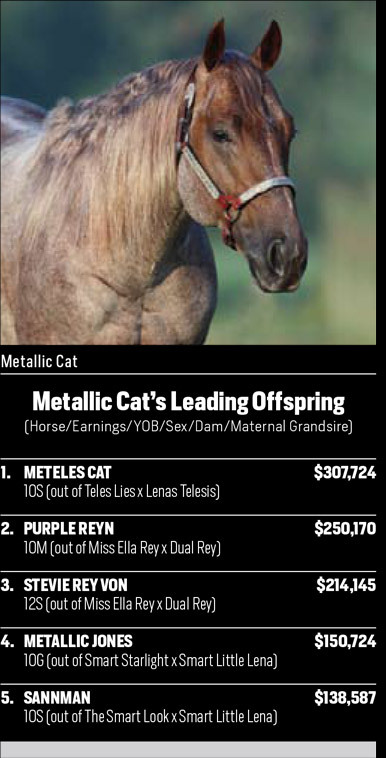 Metallic Cat, who is owned by Alvin and Becky Fults, of Amarillo, Texas, currently sits at the top of the reined cow horse junior stallion chart, as well. He has total offspring earnings in excess of $7.25 million.